Southern California Ballet brings the comedy ballet, Coppélia, back to the stage for the first time in over a decade starring alumna and local principal dancer Stephanie Maiorano. 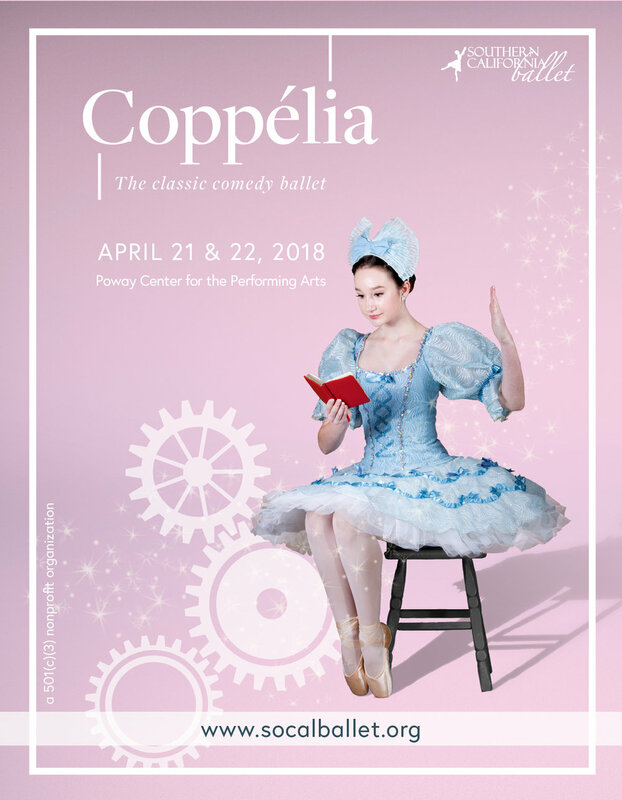 San Diego, CA — This year, Southern California Ballet’s annual spring production is the charming and comical ballet, Coppélia, originally staged by former artistic director Sylvia Palmer in 2002 and last performed in 2007. Over a decade since Southern California Ballet last performed Coppélia, new artistic directors Martha Leebolt and Tobias Batley are thrilled to breathe new life into the production by restaging it for the next generation of dancers and audience members to enjoy. The production will feature guest artists from San Diego Ballet, Stephanie Maiorano (a Southern California Ballet alumna) and Adam Bloodgood in the principal roles. Vincent Padilla will also be performing with Southern California Ballet in the role of Dr. Coppélius. Of particular excitement is the return of Stephanie Maiorano, demonstrating the strength of Southern California Ballet’s training in the achievements of its alumni. The performances were made possible by Southern California Ballet’s fundraising gala, “Coppélia’s Ball,” which took place in February. The nonprofit organization’s community of supporters raised over $10,000 to make the performances happen. Synopsis of Coppélia - Originally premiered in Paris in 1870, the lighthearted tale revolves around a girl named Coppélia who spends her time sitting on the balcony of Dr. Coppelius, the local mad scientist, reading and not speaking to anyone in the town. After learning that Coppélia is actually a doll built by Dr. Coppelius, Swanhilda decides to impersonate the doll in order to win the love of Franz. Chaos ensues, but in the end, all is forgiven. Swanhilda and Franz reunite, get married, and the whole town celebrates with dances in their honor. Save the date! Public performances of Coppelia will take place Saturday, April 21 at 7:00 p.m. and Sunday, April 22 at 1:00 p.m. at the Poway Center for the Performing Arts. Tickets are available through both the SCB website, www.southerncaliforniaballet.org/coppelia, and at the PCPA Box Office. Tickets are priced at $20, $29, or $38. Student, senior, group, and military discounts are available. SCB supports P.L.A.Y., Poway Leisure Assistance for Youth, Girls Scouts of America, and senior assisted living centers through reduced ticket prices striving to make ballet accessible and affordable for all to enjoy.